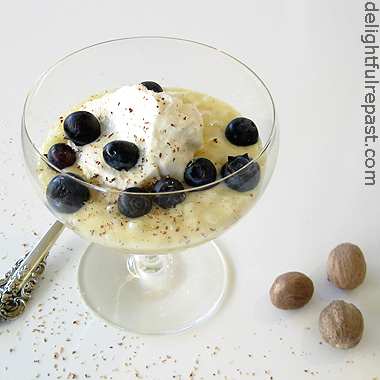 Delightful Repast: Tapioca Pudding - Not as Boring as It Sounds! Tapioca Pudding - Not as Boring as It Sounds! Tapioca pudding is one of those things you can serve to guests and everyone will say "Ooh, I love tapioca, but I haven't had it in years!" Or "since I was a kid!" I know I get on a kick and make it several times and then forget about it for years until something reminds me. What reminded me this time was a chat with my dear cousin Denise. We were talking about our favorite foods our grandmother made when we were kids. Denise recalled Ma (that's what we all called her) having, shall we say, mixed results with her tapioca. One time it would be heavenly, and the next time rather gluey (Denise liked it either way). I thought it odd that Ma would have had difficulty with something so simple, but then I figured it out. Reading. Ma and her daughters (including Denise's mother and my mother) were addicted to reading, just as we are. Growing up in a very large family in the Lake District (northwest England), her favorite task was making all the beds. Not because she especially liked making beds, but that chore gave her the opportunity to be alone upstairs and get a lot of reading done. Can't do much harm there, but ... stuff happens when you're cooking and you can't put your book down. So I imagine on those gluey pudding days, the plot was thickening and so was the tapioca. 1 In heavy 2-quart saucepan, soak tapioca in warm water for 30 minutes. Stir in milk, sugar and salt. Cook over medium* heat, stirring until sugar is dissolved. Bring to a boil, stirring occasionally, then reduce heat. Simmer uncovered, stirring frequently until thickened, about 15 minutes. 2 In 1-quart bowl, lightly beat the eggs. Gradually stir hot mixture into the lightly beaten eggs, then pour into saucepan. Cook, stirring, over low heat for two minutes. Remove from heat, then stir in vanilla. 3 Cool quickly by setting pan in larger pan or bowl of ice and water for about 10 minutes, stirring occasionally. If not cooling quickly, place a round of buttered parchment paper on the surface of the custard to keep a skin from forming, cover pan, and refrigerate at least 3 hours or up to 3 days. I do believe my mouth is watering just by looking at it. I haven't had tapioca or semolina pudding in years, reminds me of school dinners. Husband hates it and says it reminds him of frogspawn. I would imagine it is more of a winter pudding but your recipe sounds lovely served with whipped cream and grated nutmeg. Thanks, love2dine! Hope you'll try it soon. Eileen, don't listen to your husband (frogspawn, indeed! ), have some tapioca! Actually, it's a miracle my husband doesn't say the same thing--he is notorious for texture issues, but for some reason he loves tapioca. It isn't boring at all. On the contrary, it looks so very tempting with beautiful colours and wholesome ingredients. Have a wonderful weekend, Jean. Thanks, Angie! Wish I had some today, but I'm out of milk. TAPIOCA! Obviously a wonderful word misapplied. It should be a song, or a salutation shouted before a round of drinks, or – yes, yes – a dance! Tap-tap-tapioca! A tap dance. A food? Not so much. Glue, you say, maybe. Love your detective work, however. Your grandmother has been outed. ‘Scuse me now while I go invent a dance that is a cross between tap and polka. I think I'll call it… (oh, I can't say it). Yep, I hated to out her, but ... glue is glue. And you're right, it IS a great name for a dance or a festive salutation! I LOVE tapioca pudding! It's not boring to me at all. Yes, it's been a couple of years since I made it but that's only because I can't stop eating it once I make it. I like it still slightly warm and ohhh, so good! And you don't HAVE to stop eating it - MY recipe has the minimal amount of sugar, and that makes it health food! Thanks, Charles! Yes, it's time to have some tapioca (I don't know the French word for it either). My husband, parents, and I were just talking about tapioca last weekend. My husband has NEVER had it! I'll have to make this for him so he can give it a try. LOL! "the plot was thickening and so was the tapioca" I can relate. Cookies tend to get a whole lot darker when the plot thickens around here! Mary, thank you! I'm so glad somebody noticed that line! Isn't it wonderful to be one of those people who can be so enthralled with books? I've always felt bad for people who don't love reading. Thanks, Melanie! I envy people who can pick their own berries--blue, black and raspberries are so expensive most of the time.